Our heartbeats skip once when we get to know about the news of our much-awaited results. The result is the only thing for which we prepare and do hard work because, in the end, the only thing that matters is Result. 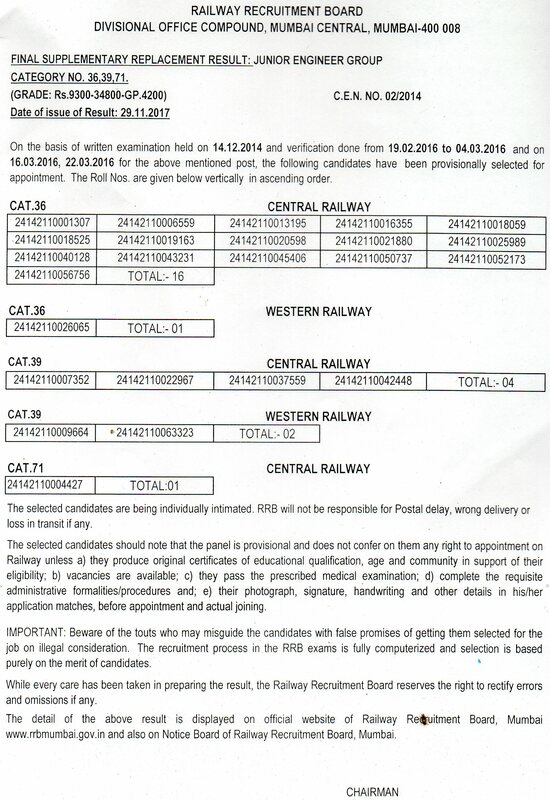 Railway Recruitment Board had earlier released the RRB JE |SSE Results for written examination under CEN No.1/2015. Those who have appeared for the RRB JE | SSE Exam were asked to check their results. After the written exam, the students were shortlisted for the document verification phase. Note: Few of the RRB’s has released the Final Supplementary Replacement Result for Junior Engineer and Senior Section Engineer posts for CEN No. 01/2015. Check the official notification from the table. 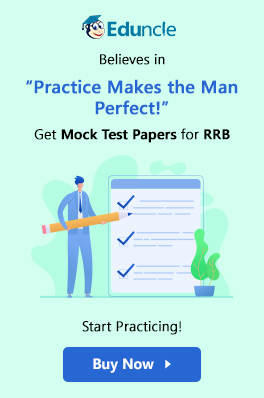 Crack RRB Exam 2018 with free mock tests and previous year papers at Eduncle-Register NOW! The official websites of various RRBs have released the result of document verification phase for the posts of Junior Engineer and Senior Section Engineer. Note: Some RRBs are still going through the document verification phase and released the list of candidates shortlisted for the document verification process. Railway Board had conducted the RRB JE/ SSE exam from 22nd Aug 2015 to 5th Sept 2015 under Centralized Employment No. 01/2015. The Board then announced the results of RRB JE/ SSE CEN 01/2015. The table below consists of the region-wise result of various RRBs. See below the details. Note: For some RRBs, there is single notification released for the Result of JE and SSE after Document verification phase and for some RRBs, the official notification is yet to be released. We will update you as soon as the notification released by the board. Kindly Stay tuned! 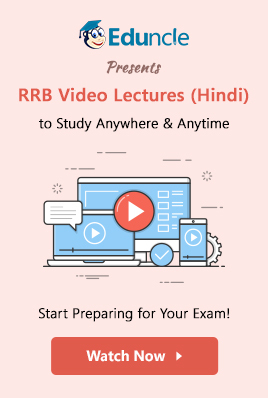 Get Sure Shot Success with Eduncle's free RRB Study Material-Download NOW!! The Railway Board had earlier released the final cut off marks list for the post of Junior Engineer and Senior Section Engineer. Check out the final cut offs, category wise for RRB JE exam 2015 under CEN 01/2015. Grab a clear overview of the cut-off range. Check out the final cut-offs, category wise for RRB SSE Exam 2015, under CEN 01/2015. Get a clear overview of the cut-off range. Railway Board is soon going to release the RRB JE | SSE Recruitment Notification 2018. As soon as the board will conduct the exam and releases the RRB JE | SSE Cut Off 2018, we will let you know the complete details. Kindly Stay tuned! Eduncle may help you to get your result faster. Since all the RRBs conduct exams on different days so the results dates are also different. Eduncle can provide you RRB JE Result 2015 Allahabad, RRB Secunderabad JE | SSE Results 2015, RRB Bangalore SSE Results 2015, RRB Kolkata SSE Results 2015 etc. Eduncle also provides RRB Question paper and Answer keys for RRB previous year exams to help you understand the pattern of the exam in a better way. 1. North Central Railway, Allahabad has released Final Results for empanelled candidates in the provisional panel for various posts of Junior Engineer under GDCE Notification dated 25th August 2013. Check the results below. 2. 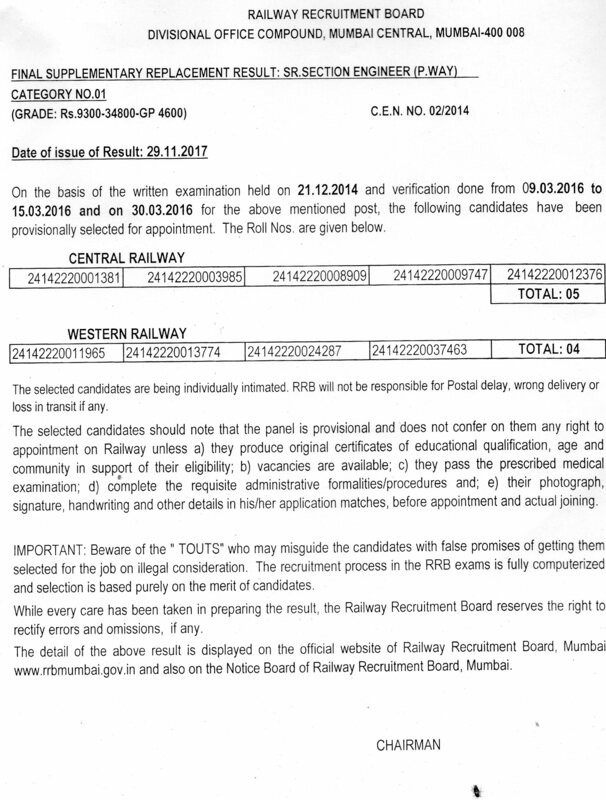 Railway Board, Mumbai has released Final Supplementary Result of various posts of Junior Engineer and Senior Section Engineer posts against CEN 02/2014. Check the official PDFs below. 3. Also, Railway Recruitment Board released a result of candidates empaneled in Provisional panel list of various RRB JE SSE posts. The list is released based on the performance of the candidates in JE & SSE Written Examination held in the month of December 2014 followed by document verification in December 2015. The Roll no. of the selected candidate are provided in the official notification below. Check it out. You can share your views and queries about the RRB exam and RRB Result. There is no secret of success. It is the result of hard work and preparation. So, keep preparing folks for better future.